With Earth Day right around the corner (April 22nd), I thought it would be especially appropriate to share a recycling DIY for the occasion. 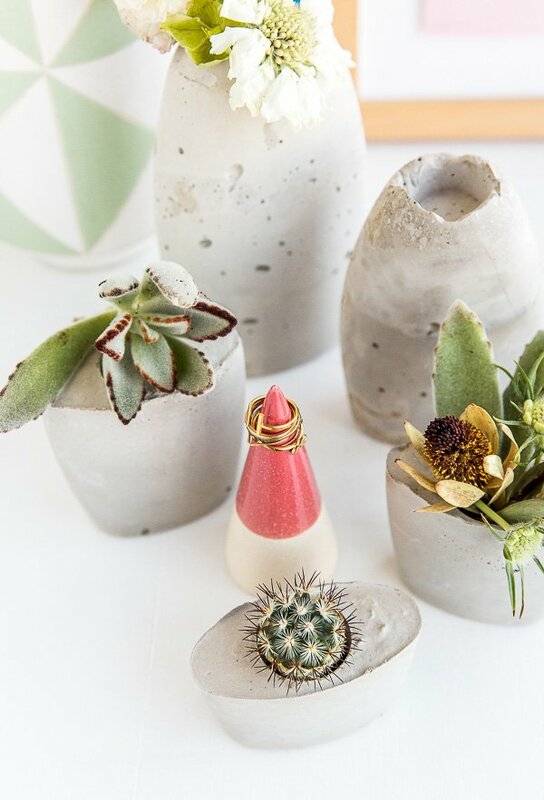 It involves using empty Aveeno lotion bottles to make really cool concrete planters. 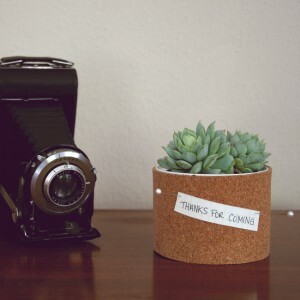 DIY planters are kind of my favorite thing at the moment, if you couldn’t tell. 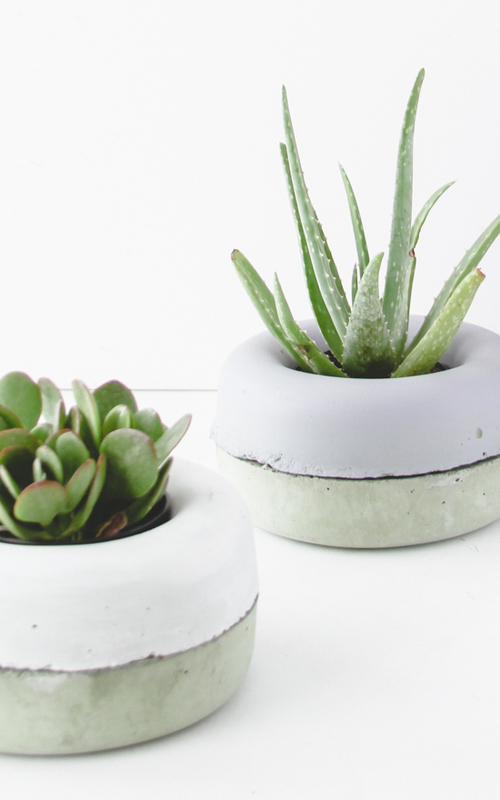 So, with some help from the folks at Aveeno and their Daily Moisturizing collection, I’m sharing a concrete DIY planter post that utilizes my empty Aveeno containers as molds for planters. AND sharing a couple of helpful recycling tips for anyone looking to up their game in the recycling department. 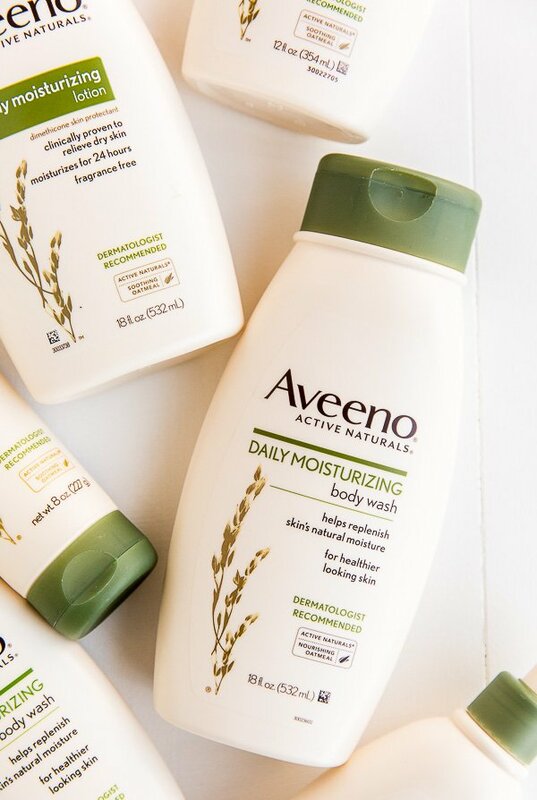 I’ve been using Aveeno products for years, but just recently tried the Daily Moisturizing Body Wash (already loved the Daily Moisturizing Lotion) and I really like it. Used a whole bottle in fact – along with their lotion. So I grabbed them out of the recycling bin and used them for today’s project. Side note, if you’re new to Aveeno, it’s available at Walgreens.com/aveeno and many other retailers. The body wash cleanses and replenishes your skin’s natural moisture for visibly healthier skin long after your shower and is gentle enough for everyday use. And the lotion improves the health of your skin in just one day, with 5 vital nutrients that lock in moisture. First, remove the pump from your empty lotion bottle and discard (the pump isn’t recyclable). Then, rinse out the inside of each container thoroughly before starting this project. 1. Then, cut off any excess parts of the bottle that you won’t need, with a sharp blade. 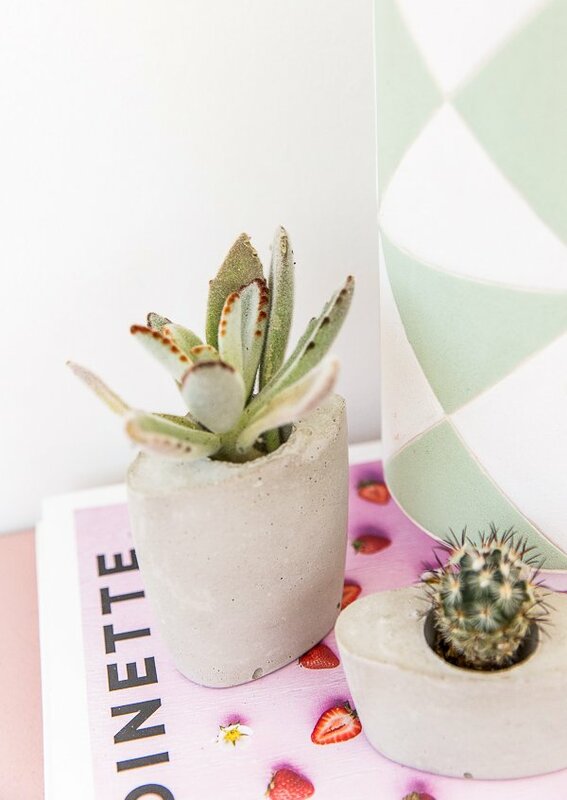 Example: For a ‘bottle shaped’ planter, you’ll want to cut off just the very top of the container. For a shorter, squatty planter, you’ll want to cut the bottle in half, etc. Recycle any leftover bottle pieces that won’t be used. 2. Add the cement mix to a bucket or large container and stir while adding in the water. You’ll need 4 parts cement to 1 part water. Be sure to mix the two together really well, while moving fairly quickly since rapid setting mixes start to set up relatively fast. 3. Scoop cement mix into the bottle molds with a disposable spoon. Then, place small plastic cups, filled with something heavy to weigh it down (I used lentil beans as a weight), into the top of the container, as shown in the photo. 4. Wait for the concrete to dry. If you’re using a rapid setting concrete, like mine, it should be completely dry in 1-3 hours (depending on the temperature, etc). 5. 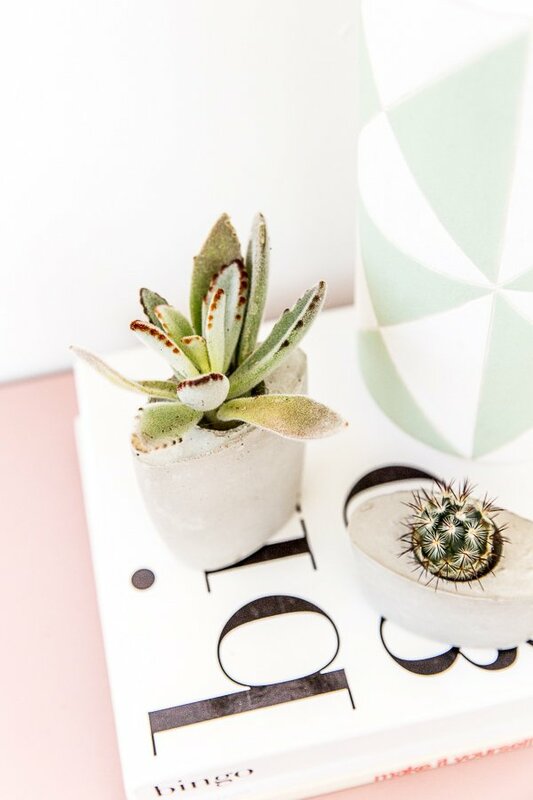 Once the concrete has set and is hard to the touch, use a sharp blade to cut the container away from the concrete, being careful not to scratch the concrete itself. I found it easiest to score the plastic in a long line and then slowly go over the score line again, while pulling the plastic away to ensure that the concrete didn’t get scratched. Once the plastic has been removed from the concrete, be sure to recycle the bottles. 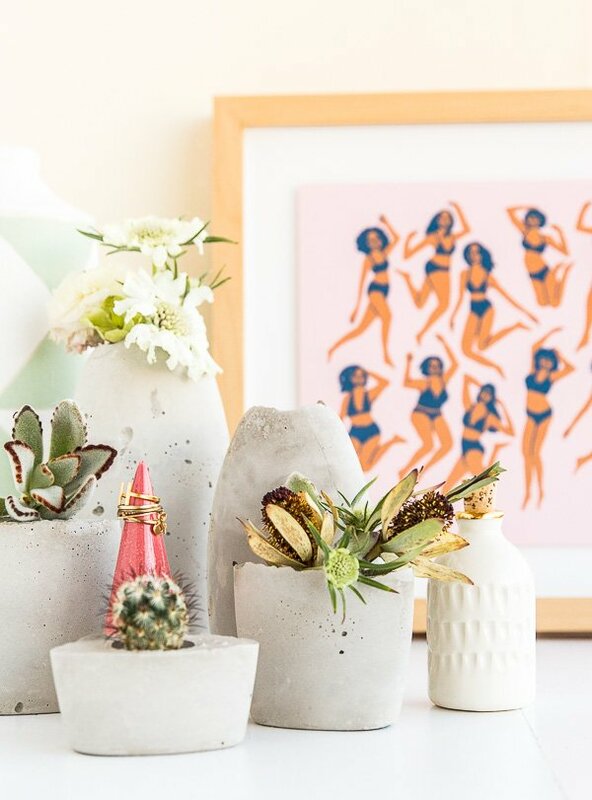 Add small plants and you’re good to go. Help the planet and save space in the smallest room in the house by using a divided waste basket. 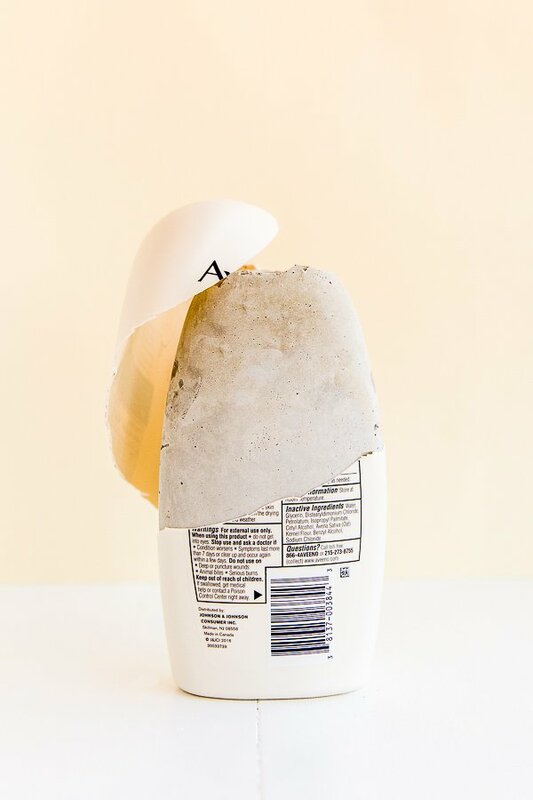 Use one side for recyclable items, like cardboard packaging, toothpaste tubes, plastic lotion bottles, etc and use the other side for non-recyclable items, like lotion pumps. And don’t forget to give bottles a quick rinse before tossing into the recycling. 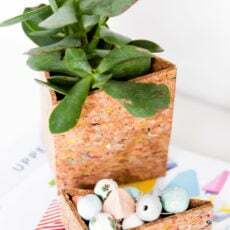 Think you’ll give this DIY planter a try? Have any special plans for Earth Day? This post is in partnership with Aveeno. Thank you for supporting the brands that help keep Paper & Stitch running. Are you missing the Amazon link for the concrete? I want to give these a try asap! This is a perfect idea, and the planters look amazing! Oh my goodness! I love this and hope to give it a try this weekend. Looks doable too. Most DIY projects are so complicated, so I never try them. This is perfect! This one is TOTALLY doable, Laurali. Let me know how it goes! This is awesome, Brittni! I’m trying to increase the number of plants in my house, but haven’t decided what to do about the planter situation. I’ll definitely try this out this out as one of my DIY projects. Cool Jake. Let me know how it goes. Love this! It’s very creative! I love the look of this blog and the original idea that you have. I would never have thought of this though by exploring other blogs I do get some ideas. I like that you have taken time to include photos as well.